Former Morwell student Melissa Bruerton (pictured centre) has been awarded a Rural Medical Scholarship funded by Gippsland Rotarians through the Gippsland Education Trust. 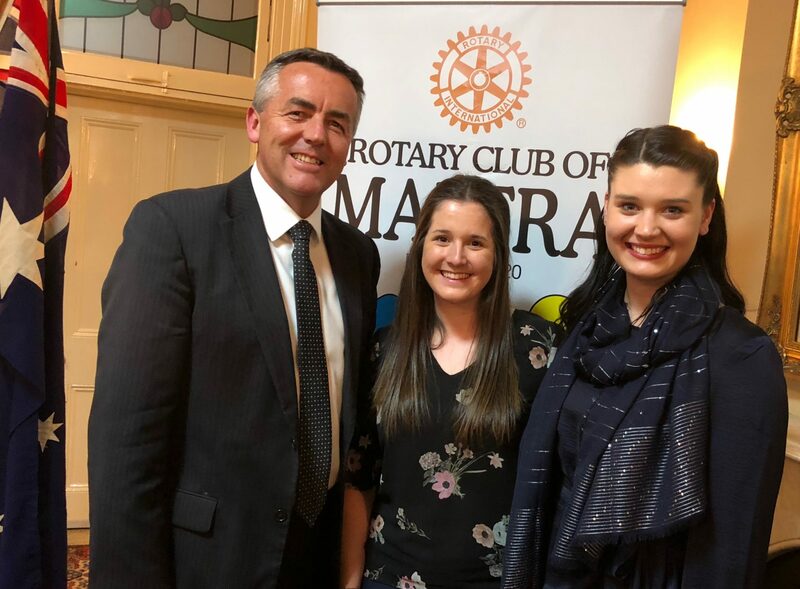 Ms Bruerton is pictured with Federal Member for Gippsland Darren Chester and fellow scholarship recipient from Maffra Jacoba Van Wees at a Rotary Club of Sale dinner this week. Ms Bruerton is a past student of St Vincent’s Primary School, Morwell, and St Paul’s Secondary College, Traralgon. Federal MP Darren Chester has congratulated Gippsland Rotarians for providing scholarship funding to local medical students. Speaking at a Rotary Club of Sale dinner in Maffra this week, Mr Chester highlighted the need for more regional students to have a pathway for studying medicine. He congratulated local students Melissa Bruerton and Jacoba Van Wees on securing the Rural Medical Scholarships through the Gippsland Education Trust. “We know that students who come from regional areas are more likely to practise medicine outside of the capital cities and there is a severe shortage of doctors in many rural and regional locations including Gippsland,” Mr Chester said. “The Federal Government has a range of programs in place to attract doctors to regional areas, but nothing beats home grown students returning to practise in the region they love.